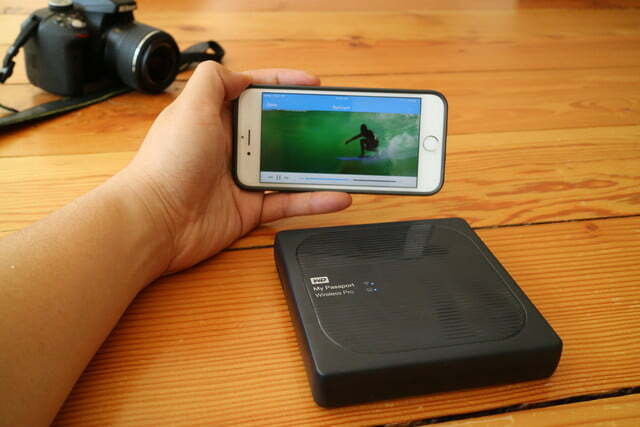 When Western Digital (WD) released the My Passport Wireless back in the latter half of 2014 it attracted the attention of creatives, specifically photographers. Having the ability to back-up images from an SD card to a battery powered drive, while still being able to access the images via Wi-Fi (a portable server) seemed like a dream come true. Unfortunately for these users, the My Passport Wireless had not been designed with heavy-duty workloads in mind. The SD card backup process is torturously slow, and the built-in Wi-Fi app does not support viewing of RAW file formats that advanced photographers need. To that end, those with less demanding needs were able to get good use out of the product, but by and large, creatives and photographers were left something more to be desired. It seems WD noticed this as well, and created the new My Passport Wireless Pro. This time, it was designed from the ground up with professional workloads in mind. 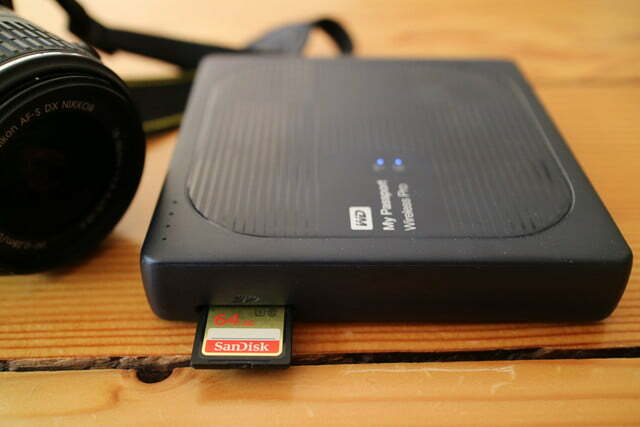 SD 3.0 means transferring images from a card to the hard drive will be quick and painless. USB 3.0 connectivity means transferring files from this drive to your computer, or from another portable drive to the My Passport Wireless Pro, will be fast as well (although the original My Passport Wireless also had USB 3.0). Another nod to creatives: The drive, via the app, supports Adobe’s Creative Cloud platform, allowing you to directly upload content to the cloud. 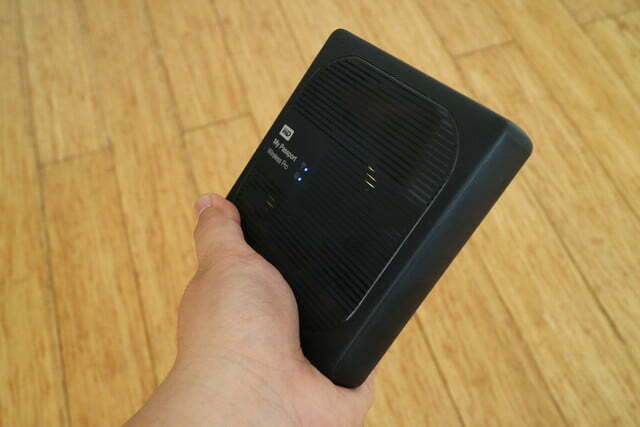 The My Passport Wireless Pro also boosts battery life up to 10 hours, a welcome improvement over the previous model. 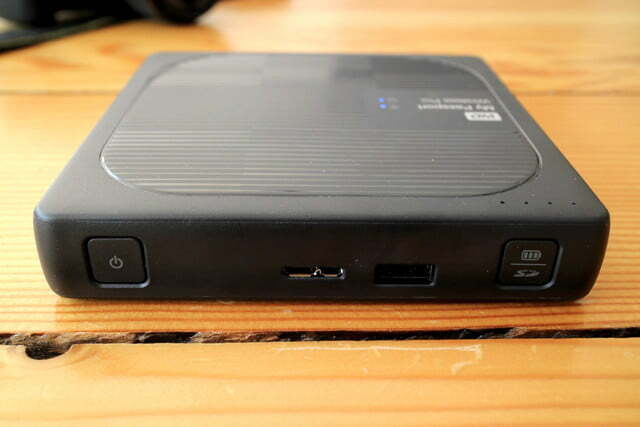 But another perfect improvement – and an ingenious upgrade – is the addition of a power bank to charge a phone or tablet off the My Passport Wireless Pro’s battery – essentially turning the unit into a 3-in-1 device capable of charging, backup, and streaming. 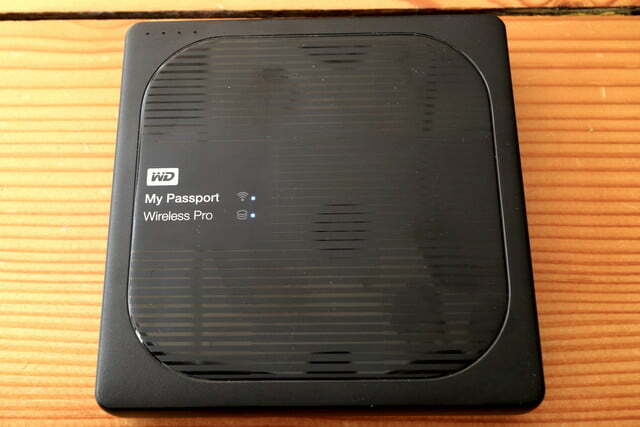 Yes, that’s right, the My Passport Wireless Pro can function as a media server or wireless hotspot. You can connect the drive to a network and turn it into a wireless router to provide Internet access to multiple devices, or stream movie and music files via Plex or DLNA/UPnP. WD says the drive can stream up to eight HD movies (MP4 at 8Mbps) at the same time. The wireless functionality itself received quite the upgrade as well, moving up to 802.11ac from the 2×2 N protocol of the original model. 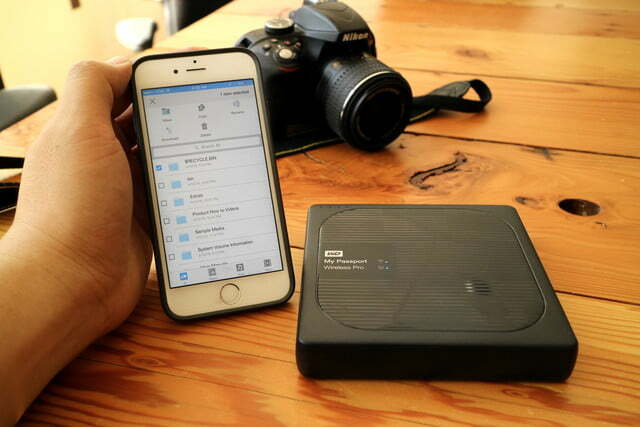 This means that with compatible cameras that support wireless FTP transfers, you can do more than just look at images on the hard drive from your phone – you can actually connect the drive to the camera and save images from the camera directly to the drive wirelessly. The more robust Wi-Fi is also what allows the device to function as a media server. 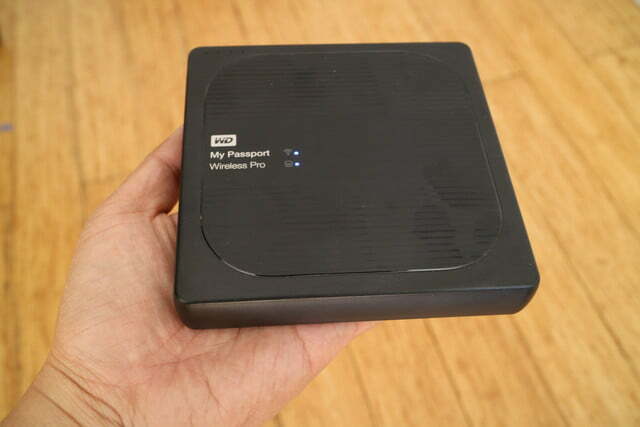 The My Passport Wireless Pro weighs in at roughly a pound, while measuring 5 x 5 x 1 inches. In other words, the unit is still small and easily fits into bags or coats with a spare pocket. It’s larger than the original, but doesn’t feel any heavier. The My Passport Wireless Pro will come in 2TB and 3TB variants, with suggested retail prices of $230 and $250, respectively. WD will also continue to sell the original to less-demanding users who want a more affordable solution. The new drive is available today at the WD Store, Amazon, and select retailers worldwide. 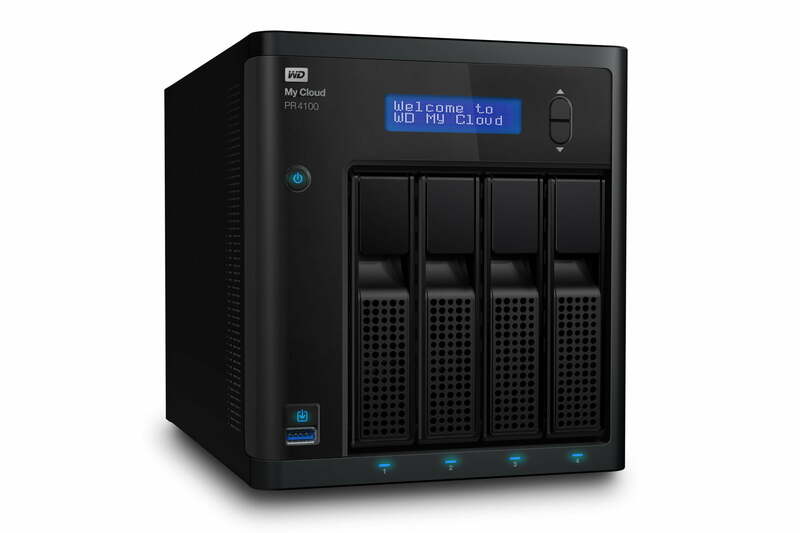 In related news, WD also announced the new My Cloud Pro Series of network-attached storage (NAS) drive. 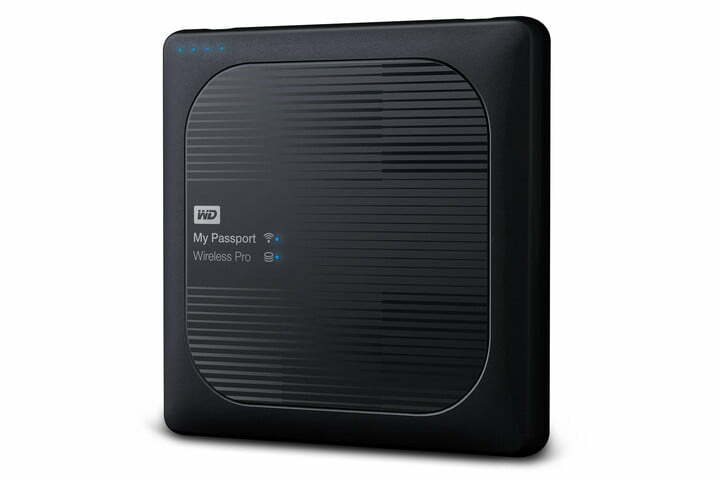 Like the My Passport Wireless Pro, the My Cloud Pro is part of the WD Pro series and it’s also designed with creatives in mind, but NAS drives are meant to stay put in a home or office, of course. Besides backup, the new NAS is fast and robust enough to handle on-drive editing of photos and design files, while also doubling as a Plex/DLNA/UPnP media server. 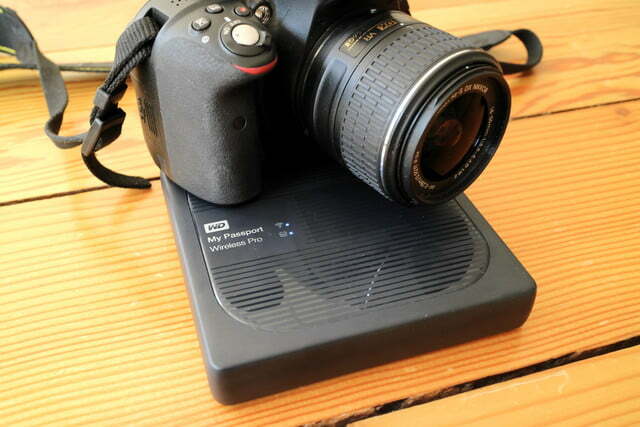 Connect a camera, USB drive, or even the My Passport Wireless Pro to it, and it’ll automatically back up the content from the attached devices with one push of a button. The drive is also smart enough to know what files have already been backed up, saving you the trouble of dealing with duplicates. Because the function of the NAS is to serve heavy loads of data, there’s no Wi-Fi, but it’s capable of streaming 4K content – important for video editors – and can be accessed remotely. My Cloud Pro NAS starts at $400, depending on the two-bay or four-bay configuration (i.e., how many hard drives are in it, and at what capacity). WD My Cloud Pro NAS in four-bay configuration.